"It is often said that education and training are the keys to the future. They are, but a key can be turned in two directions. Turn it one way andyou lock resources away, even from those they belong to. Turn it the otherway and you release resources and give people back to themselves. To realizeour true creative potential--in our organizations, in our schools and in our communities--we need to think differently about ourselves and to actdifferently towards each other. We must learn to be creative." 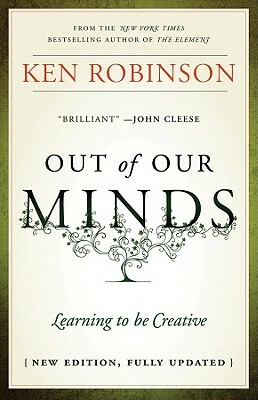 "PRAISE FOR OUT OF OUR MINDS"
--Ken Blanchard, co-author of "The One-minute Manager and The Secret"
--Warren Bennis, Distinguished Professor of Business, University of Southern California; Thomas S. Murphy Distinguished Rresearch Fellow, Harvard Business School; Best-selling Author, "Geeks and Geezers"
--Mihaly Csikszentmihalyi, c.s. and d.j. Davidson Professor of Psychology, Claremont Graduate University; Director, Quality of Life Research Center; Best-selling Author, "Flow"
--Howard Gardner, a. hobbs professor in cognition and education, Harvard Graduate School of Education, Best-selling Author, "Frames of Mind"
SIR KEN ROBINSON PhD is an internationally recognized leader in the development of creativity, innovation and human resources. He speaks to audiences throughout the world on the creative challenges facing business and education in the new global economies. Sir Ken is Professor Emeritus of Education at the University of Warwick in the UK and has worked with governments in Europe, Asia and the United States, with international agencies, Fortune 500 companies, and some of the world's leading cultural organizations. His renowned talks at the annual TED conference (2006 and 2010) continued to be viewed online by many millions of people around the world. In 2003, he received a knighthood from H.M. Queen Elizabeth II for his services to the arts. In 2005 he was named as one of Time/Fortune/CNN's Principal Voices. He has received numerous honorary degrees and awards for his international work in education, creativity and cultural development. He is author of New York Times bestseller The Element: How Finding Your Passion Changes Everything, which has been translated into 20 languages.